... despite the fact that the weather hasn't quite gotten the memo for some of us yet. When I think of Spring, I can't help but think of Easter and bunnies, to which my brain then settles on a vision of rich green fields of grass, bouncing puffy tails and bursts of orange popping up from the ground ready to be crunched. Upon doing a bit of research, and because I have a weird obsession with finding the deeper meaning or symbolism to everything, I recently discovered that carrots symbolize fertility and lust apparently due to their connection to rabbits (I guess the term 'doing-it-like-bunnies' isn't just a euphemism). That said, when carrots appear in dreams, it is said to mean that the dreamer may be avoiding situations or problems they don't want to face. If you are eating the carrot in your dream, it could take on more of a 'food-for-thought' meaning or the arrival of something new in your life. In terms of the carrot itself, it's bright and luscious colouring can symbolize standing out and being unique or health and vitality due to it's jammed packed nutrients. Who knew on single vegetable could hold so many meanings in it's earthy roots? I also like to believe throughout our lives we create our own symbolism surrounding the many festive filled foods, images and traditions of our world. For that reason when I think of carrots, or more specifically carrot cake, I think of my nana who always asked for a carrot birthday cake in the middle of winter. I think of the carrot cupcakes that were passed around my elementary school classroom from the mom of one of the students who would always bring sweet festive baked goods each season or holiday. Lastly, I think of the new tradition I have created to dunk a good chunk of this cinnamony, nutmeg goodness into my coffee while I read my morning chapter in the presence of new spring flowers and plants. Whether you like carrot cake or not, I suggest you give the recipe a try. I was never one to LOVE a good carrot cake, but with my sudden insistent need to bake one (and I tend to trust my baked good craving impulses) my once meh-attitude about the odd combo of carrots and cake turned into a full blown new found love for the texture and spices that have me itching for Spring. So while we wait for the temperatures to catch up to the timing of the year, why not grab your baking pans, mixing bowls and shredded carrots and call forth the season with a festive treat? In a large mixing bowl, combine dry ingredients (flour, baking powder, baking soda, cinnamon, nutmeg, salt). Mix together! In a different bowl, combine remaining ingredients (apple sauce, almond milk, sugar and melted butter). Mix! Slowly add wet ingredients to dry, mixing as you go. 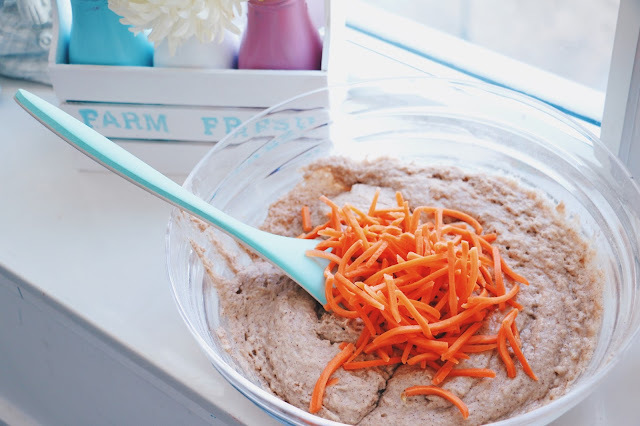 Finally, add in your carrots and mix and flip batter until fully combined. Let cool. In the meantime, make buttercream glaze. Combine icing sugar, vegan butter (unmelted) and vanilla almond milk. Yum! Can’t wait to try the recipe !!! This is INCREDIBLE. I can't stop eating it. Definitely making another batch! i reallyyy want to try it !!! I was looking to make something like this! It was perfect timing, thank you! Looks lovely. Tried this. . . Literal heaven. I never k ew I needed this. This recipe smelled delicious while it was baking, however since I only used one large pan, it didn’t get done in the time listed. Unfortunately I took it out way too soon and was only able to enjoy a little bit as the middle was way undercooked. Next time I will definitely use two smaller pans! I love trying out these vegan recipes, I’m trying to find ways to get all my vitamins and minerals from all vegan foods, it’s been a challenge for me but Your recipes have help keep me motivated:) love ya Kalyn!